Between prepping meals, eating meals and cleaning up after meals, my family spends the majority of our waking time in the kitchen. Our kitchen also opens into the hearth room which adds to the number of hours spent in this area. So, this got me thinking about what one could do in the kitchen to help promote literacy development in our youngsters. The ideas kept flowing, so I thought I’d share some of the better ones with you! 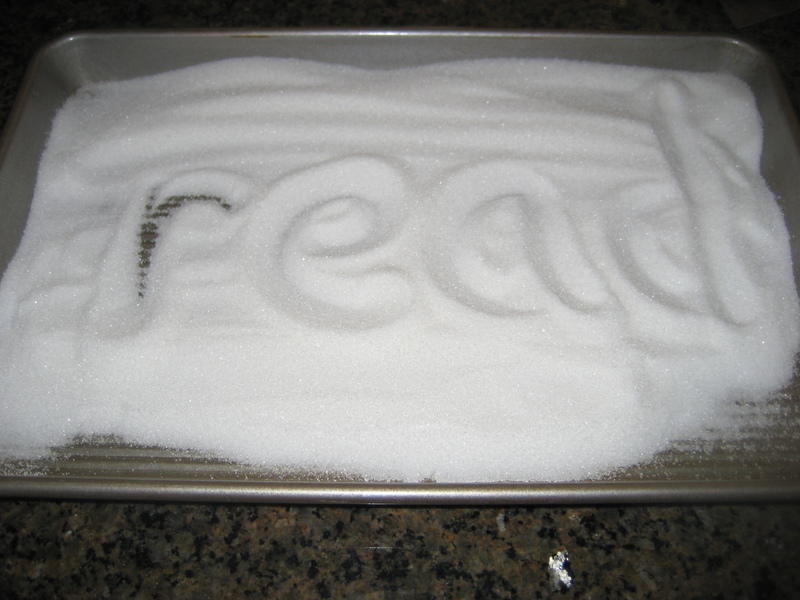 Tactile learners will enjoy practicing letter or word writing with their finger in a shallow container of salt or sugar. When they are done, store the sugar or salt in a labeled Ziploc bag for future use. Have you had some spices in the back of the cupboard for years? Pull them all out (Throw out the ones that don’t have a scent anymore!) 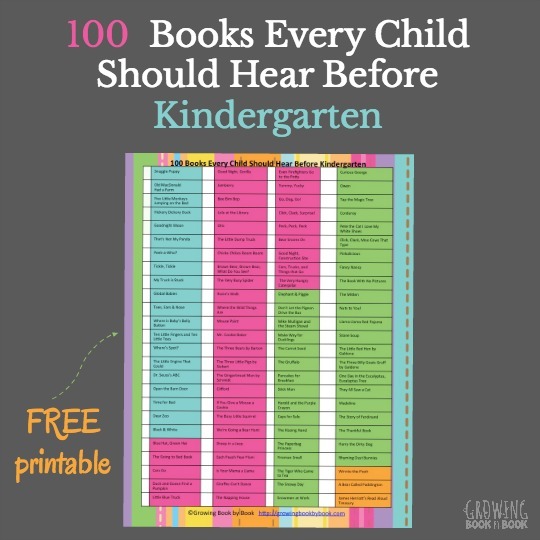 and let your child put them in ABC order. 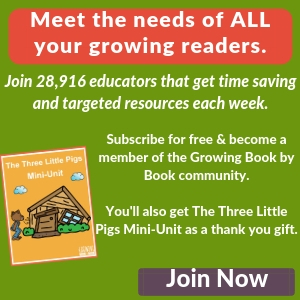 Not only will it provide a literacy opportunity for your child, but it will also organize your life. 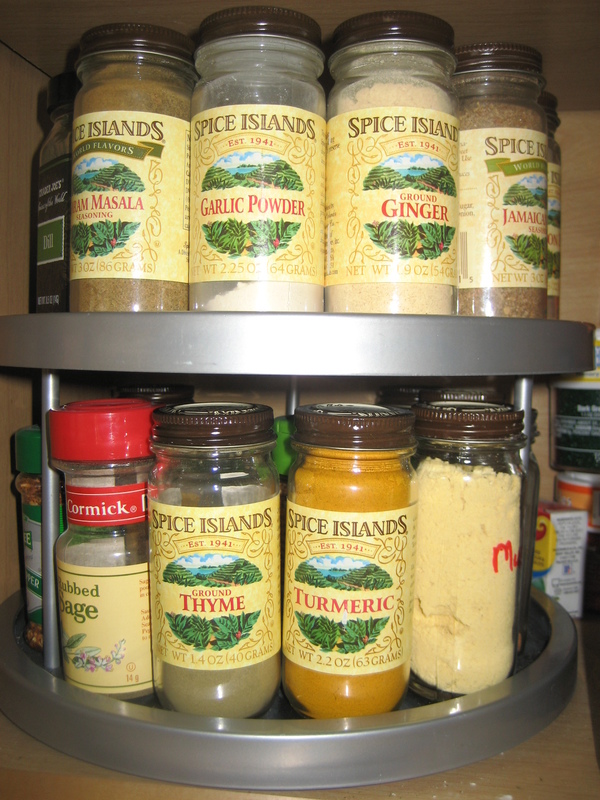 I’ve had my spice cabinet alphabetized for years. It makes cooking so much easier. For over a year now, I’ve created a weekly dinner menu and posted it on one of my favorite blogs, This Week for Dinner. I’ve found that it has decreased our grocery bill and has helped me to create more balanced meals. 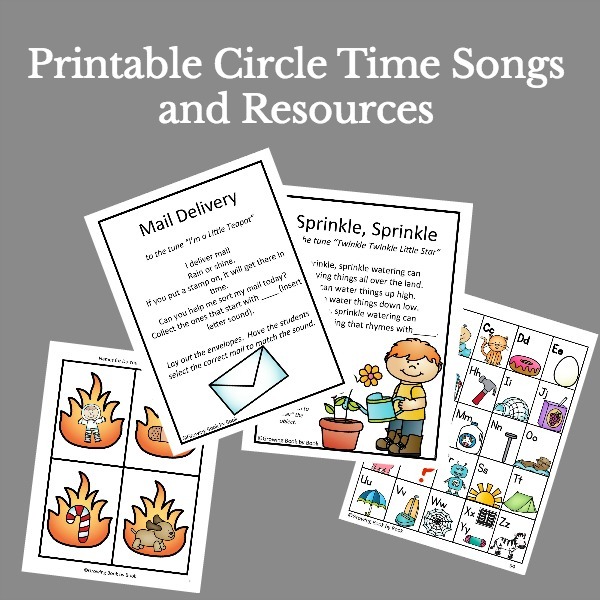 Creating a menu for a day or week is a great activity to do with your kids. This especially works well with picky eaters. If you allow the kids to have some input into planning the menu, they generally will try more foods. Pull out some cookbooks, and pick out some new recipes out to try. You are not only helping your child make food choices, but you are helping them develop their reading and writing skills. Kids could post the weekly menu on the refrigerator or display it on the table for the whole family to see. Then, get the kids to help you create a grocery list to support the menu! Oh, the real world writing possibilities! A tasting passport is an extension of the idea above. Create a passport complete with your child’s picture. On each page your child can draw a picture of a new food or cuisine they have tried. Younger children can label each picture using inventive spelling. Older children can write about each tasting experience. The goal is to see how many passport pages your child can fill. What a great way to get picky eaters to try new foods. 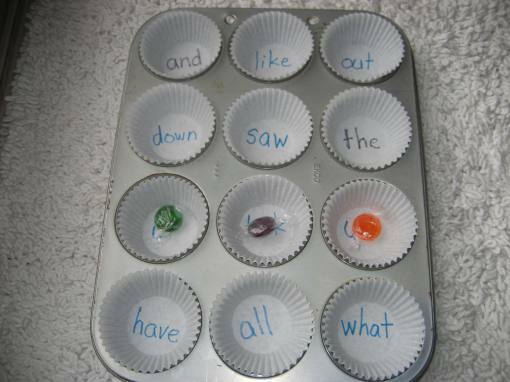 Last year, I posted several muffin tin literacy games that use a muffin tin and a few other supplies. It is my most popular post to date. If you haven’t seen it, check it out. For an extra special breakfast, make pancakes shaped like letters. Then, during breakfast, have your child brainstorm words that begin with the sound each pancake shaped letter represents. 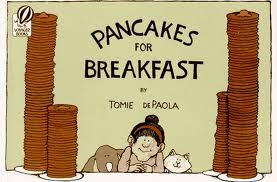 aWhy not share the book, Pancakes for Breakfast by Tomie DePaola during this special morning time too. A variation of this to idea and use it when baking bread or pretzels. Let your youngster form letters using strings of cooked spaghetti. This is a simple activity for your child to do while you are prepping something in the kitchen. Have your child create placemats for tonight’s dinner. Simply give your child some paper and crayons/markers and a literacy starter. Here are a few ideas to get you started. Draw your favorite scene from a book you read today. Pick a letter sound and draw or write as many things as you can think of that begin with that sound. Divide your placemat into three sections. Draw a picture of the beginning, middle and end of a story we read today. Write a note to each family member and then decorate it. Create and decorate a name poem for each family member on their very own placemat. Don’t forget some of the common, simple and easy ideas such as using magnetic letters on the refrigerator to spell words. 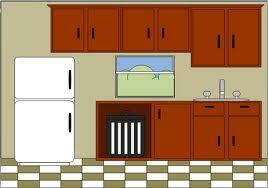 The refrigerator is also a great canvas for displaying your child’s work. Or, how about pulling out the cereal box and reading the nutritional label. 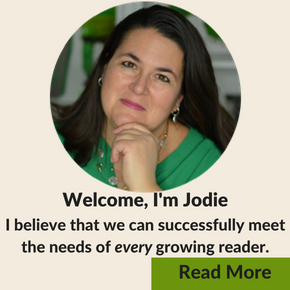 How do you help develop literacy in the kitchen? Please check out the linky party page to see where this post has been linked to for the week. These look like fun ideas! Following you on fb. Great suggestions! My daughter loves to cook. Maybe that will help her learn to read. Stop by Mom’s monday mingle tomorrow! Your blogs are always so creative and packed with ideas, I would never think of. I guess I’m years beyond being a mommy. But, you are so original. Enjoy your posts.